After defeating Veselin Topalov in their 2006 match, Vladimir Kramnik was officially the undisputed world champion -- although he had been largely regarded as such since his 2000 match victory over Garry Kasparov. In 2007, a round robin tournament was held in Mexico City, which officially decided the world championship. This was the first time since Mikhail Botvinnik's victory in the The Hague/Moscow tournament in 1948 that the world championship has been decided by a tournament rather than a match. I remember wondering at the time why Kramnik would agree to this arrangement rather than insisting on putting his title on the line in a match; however, he was guaranteed a match with the winner of the tournament. 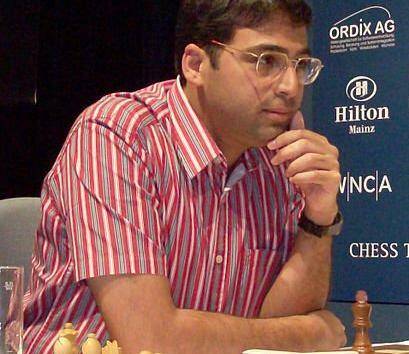 Viswanathan Anand won the tournament a point ahead of Kramnik and Boris Gelfand, and thus became the world champion. However, this article will focus on his subsequent match with Kramnik -- as this fits into the topic of my column: looking at the endgames played in the battles between world champions. Anand was born in 1969 in the town of Mayiladuthurai, India. Although at the time chess was not very popular in India, his mother is a chess aficionado and taught him to play. His progress in chess was very rapid, and at the age of 18 he became India's first-ever grandmaster. He broke into the top level by winning the Reggio Emilia tournament in 1991. What was most amazing about Anand was that he played at an incredibly rapid speed when he was young. It was not unusual for him to defeat grandmasters while using under half an hour. In some cases, due to the increment he ended up with more time than he started with. By 1995, he had qualified to play a match with Kasparov for the world title; however, he was not in Kasparov's league at the time, and he would have to wait 12 more years before he became the undisputed world champion. However, in 2000 he did win the FIDE world championship, which was held with a knock-out format in those days. 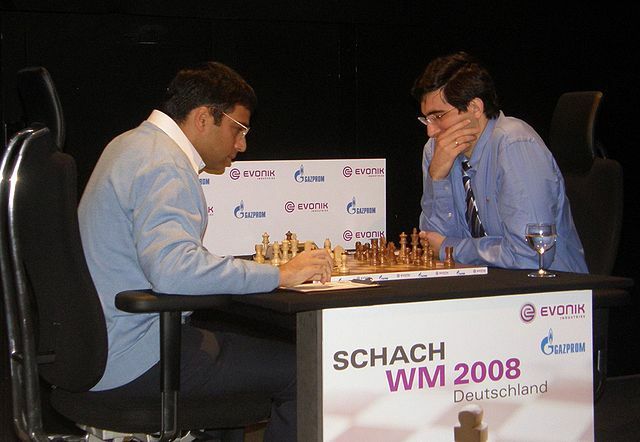 The Anand-Kramnik match took place in Bonn, Germany in 2008. It was largely decided by Anand winning twice as black (in games three and five) in the same razor-sharp variation of the Semi-Slav. Anand then won a third game, as white in a Nimzo-Indian, which basically put the match away -- it is this game which we will analyze here. Three draws followed, and despite Kramnik's victory in the 10th game (when Anand only needed a draw to win the match), Anand managed to draw in the 11th, and thus won the match by the score 6.5-4.5, to become the next classical world champion. Watch GM Ben Finegold's video on an exciting game between Kramnik and Caruana. Play as Anand in the Chess Mentor. Practice your world-championship-level combinations in the Tactics Trainer. Looking for articles with deeper analysis? Try our magazine: The Master's Bulletin.